I went to see the film Jason Bourne a couple of weeks ago, the latest instalment in the Matt Damon/Paul Greengrass (mostly) spy thriller saga. In my defence, it was a quiet week; I have argued that cultural geographers should be a lot more interested in popular (visual) culture (here, if you’re interested); and it was one of Sight and Sound magazine’s films of the month. So off I went. Coming out of the cinema, I felt I’d been turned into a sort of visual punchbag, subjected to frequent slapping image impact for the movie’s full 123 minutes and 10 seconds. Once my head cleared a bit, though, it did seem to me that there were some interesting things about that visual experience, several of which are pointed to by Sight and Sound‘s review of the movie, written by Henry K Miller and which you can read in full here. The triple crisis of the modern spy movie is the redundancy of human intelligence, of the secret agent, and of spectatorial agency. Wow. That’s quite a claim. But in Bourneworld it’s true: the spy is replaced by digital databases; no one can hide from digital surveillance now; and since what is knowable and visible is mediated by digital tech, the filmic ‘realism’ of classic cinema is redundant. This has various consequences. For example, simply looking at the world isn’t enough any more to give movie spectators the evidence they need to figure out the plot; instead we have to be shown endless screens and their information (computer screens, desktop and laptop and wallsize, and phone screens, get a lot of screen time in the movie). And if what screens show become a crucial part of the action so too, therefore, as Henry also points out, does the control room: the darkened room where CIA operatives stare at screens. (Interestingly, the more senior the CIA official in Bourneworld, the less glued to a screen they are – though the movie also suggests that understanding the culture of the digital world is increasingly important for such characters). The aesthetics of those screens are interesting too. They carry all sorts of images, from photographs to printed text to maps to satellite images to real time data flows to animated algorithmic calculations to graphics of many kinds, and often switch from one to the other with complete ease (there’s no bugs or glitches in Bourneworld, though there are hackers, of course). They have a visual profligacy which is typically digital (I’ve written about a different kind of example of this here.) And data is shown in neon colours glowing on black backgrounds, which is very typical too: a lot of smart city visualisations use the same colour range. In Jason Bourne, it’s screens that appear to offer greater insight into both the events structuring the film and into the films’ characters too. You don’t go to any of the Bourne movies for extended, introspective dialogue, as several critics have pointed out, it’s true. But it’s still striking that Bourne’s motivation and even creation is explained in the movie by an online document, which we read on a screen over Jason’s shoulder. And the camerawork that captures the characters as human bodies (rather than the screen aesthetics that capture them as data) is relentlessly mobile and choppy, fragmenting what can be seen into near-incoherence. And if the characters are often represented as the data trail that they leave as they move, the final fistfight seems to take particular pleasure in emphasising the embodied human as disposable ‘wetware’, with blood and grunts and close-ups of stranglings, very visceral, and very vulnerable: huge numbers of bodies are simply felled in the movie by assassins of various kinds. All this happens at speed: everything happens fast in the film. No-one starts a car slowly, or strolls aimlessly; engines are revved, walking is purposeful and more than likely to break into a run. The camera wheels and pans relentlessly. It’s all about flow – just like digital networks. So, while the movie doesn’t advance the spy movie genre (though the final car chase is a pretty damn fine exemplar), or indeed the conventions of the franchise (as Henry also comments), it does offer an intriguing commentary on some of the visual recalibrations occurring as the visual field is more and more produced digitally. 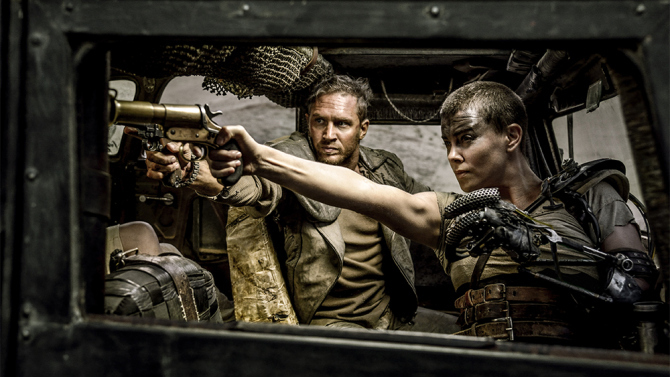 Of the many reasons to be grateful for the journalist Laurie Penny, her review of the movie Mad Max: Fury Road now ranks pretty high for me. Thankyou Laurie – and Jessica Valenti – for tipping the guilty pleasure of the film much more towards the pleasure than the guilt, by writing fantastic reviews that suggest it’s a really feminist movie. There’s also a great Tumblr site giving Max new lines, all feminist-y too. Ultimately, though, the burning Mad Max question is: how does a professor get to be listed in a Mad Max film credits?! I swear I saw two profs thanked as the credits rolled. Who are they, what did do they do to get thanked, and (depending on the answers), can I do it too please? I don’t very often blog just to enthuse, but today is an exception. 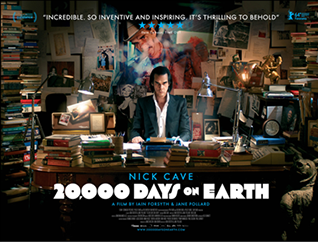 I’ve been to see the film 20,000 Days on Earth, directed by Iain Forsyth and Jane Pollard about a sort-of day in the life of Nick Cave, and it is just fantastic. Visceral, funny, weird, lots of rain and sea stuff, amazing scenes of Nick Cave singing, a slightly freaky psychoanalyst – my god he listens intently – Kylie Minogue, and a voice-over from Nick Cave musing on memories, performing and writing. If you love writing, go see the film to hear him talk about writing his songs, it’s a beautiful account of the process – even if you don’t like his music – but how could you not. Fantastic cinema. I gave a talk at the final meeting of the Nordic Research Network in Digital Visuality last week, thanks to a kind invitation from Karin Becker. It was a great workshop, full of interesting presentations. I particularly enjoyed catching up with the work of Robert Willim, an Associate Professor of Ethnology at Lund University in Sweden. Also a musician and a filmmaker; his Vimeo channel is here, and he discusses the link between his academic and art work here. The works are made solely from audio and videomaterial found on the web, material that emanate from a specific place. The audiovisual pieces are manipulated and composed into a surreal journey through an estranged landscape. The films are based on the culturally bound and stereotypical preconceptions of the artists. They were a nice play on the idea that site-specific artwork has to be based on a first-hand, intimate – and therefore somehow more authentic – encounter with a place. He discusses them in the book Anthropology and Art Practice, which came out last year from Bloomsbury. At the NRNDV workshop, he screened three more recent pieces, all of which again explore the complexity of perception, particularly visual perception. My favourite was called Fieldnotes, a really beautiful encounter with the otherness of a shrouded, billowing building which also suggest the difficulty of grasping what is being seen. The effect of the video is considerably enhanced by the music, which to my (non-musical) ear sounds as if it is also trying to avoid any neat tune-making structure. Unlike so many films and videos that are made by academic researchers, these short pieces don’t aim to show, reveal or describe. Instead, they meditate on the difficulty of doing those things, complicating the aural and visual fields, evoking and provoking. Lovely.